10:00am. Falmouth Rugby Club, The Recreation Ground, Dracaena Avenue, Falmouth. Template letters of objection are available for you to use and adapt, Click here. 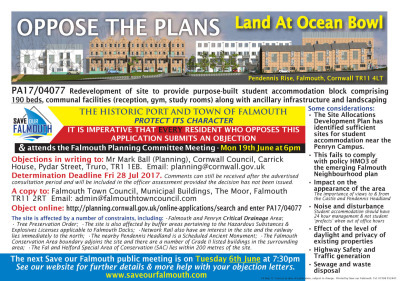 This was considered by Falmouth Town Council on Monday 19th June. Refuse as the proposal was an inappropriate land use that would impinge upon the Port Masterplan and adversely affect Dock operations. It was therefore detrimental to the local economy. 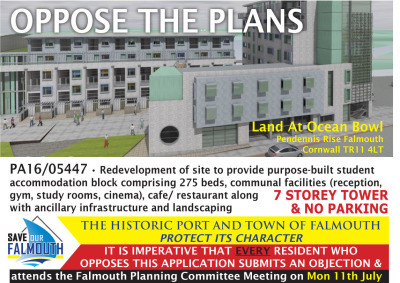 Additionally it would adversely affect tourism given its proximity to the iconic Falmouth Hotel and with a visual impact from the harbour area and loss of view from the highway. The emerging Falmouth Neighbourhood Plan recognised the need to protect and enhance these views and the site was not included in the Cornwall Site Allocations Development Plan as the Universities growth is catered for on sites elsewhere and this development is therefore neither needed nor supported. The design does not respect the NDP evidence in the Spatial Strategy report as the proposal is overdevelopment and the size and massing is not in keeping with the local area and street scene and the development would be unneighbourly. ​​ Please note: The revised SA DPD Document will go out to public consultation on 12th June 2017. The Ocean Bowl site is not allocated for Student accommodation. Suitable sites have been identified so the recommendation should be for refusal. The emerging Neighbourhood Plan will also continually gain weight and contains specific policies in relation to Purpose Built Student Accommodation. We have produced some template letters of refusal, to be given to Falmouth and Cornwall Council. 'Scale and built form will be important in relation to the residential properties that are in close proximity to the site. A strict code is needed to ensure that the mistake of building a block as insensitive and inappropriate to its setting as the Maritime Studios, does not happen on this site. The rising ground behind of Castle Drive needs to be respected, especially the view from the town of the open ground in front of the Ships and Castles, comprising Upton Redout and its line of sight. The design should have a lower height at the SW end of the site, and be lower than the bulk of the Maritime Studios at the other end.' It also recommends that the height of the building should be no more than 4/5 storeys at the easterly end, and 2/3 storeys at the westerly end. The proposed building does not fulfil these criteria, particularly the higher block with gabled elevations, which is too high. The proposal should have presented views back to the site from Falmouth, and certainly from Pike's Hill, and other viewpoints, so that its impact can be properly assessed. We have spoken to Cornwall Planning office in reference to an appeal. 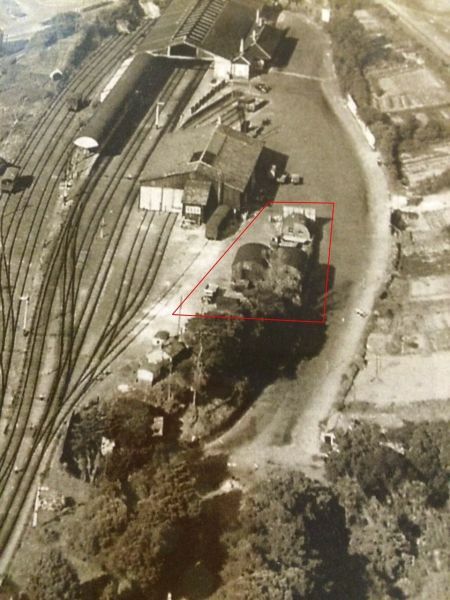 The original application PA16/05447 has been forwarded to The Planning Inspectorate in Bristol. All who made representations will be notified directly from the Planning Inspectorate in due course with appeal process and will be kept up to date with this application. Falmouth Arwenack Ward: Councillor Evans. Published Decision: refuse due to the unneighbourly bulk and massing of the design, and in regard to noise nuisance. There would be detrimental effect on views from the highway and river and within the Conservation Area, as well as harming the setting of an historic monument. The proposal did not include twenty-four hour on-site management nor a suitable and robust transport plan. Inadequate car parking arrangement, that would exacerbate car parking problems in the locality. The development would also have an adverse impact upon trees. Also the development would stymie future access and expansion plans for Falmouth Docks including future creation of a rail head. There was also the potential for noisy operations from the Docks to affect residents of the proposed development. 'There was a lot of public support to try and stop this development with many people having their own specific reasons why they did not want this to happen. The plans themselves were revised due to comments received and consultations started over again and this even resulted in an invitation by the planning committee to attend a meeting at Falmouth School on 5th October. The final decision was made at the Central Sub-area Planning Committe on 21st November, 2016. West Briton - site is Russian prison-like "massive over-development"